Having an unusual last name like 'Blattenberger' in the U.S. has caused me a lot of abuse over the years as many people have felt the need to either purposely mispronounce it or make make snide comments about its length and number of syllables. Even school teachers joined in the fray, especially on the first day of class when attendance was being taken. My drill sergeant in USAF basic training, TSgt. Ramerez, chided me about it (circa 1978). People in America with surnames of German origin were often the victims of physical abuse, alienation, and derision during both World War I and World War II. You hear a lot about the government's internment of Japanese Americans during WWII, but some Germans were also rounded up merely because of their names. The truth is poking fun at my last name never bothered me; I can take good-natured jokes (and like to deliver them as well). However, in today's world of political correctness it's funny how store clerks that still feel uninhibited in making remarks about my name when looking at my credit card would never even consider doing the same thing to someone with a long Indian or Muslim name. kludge / kloōj/ (also kluge) inf. • noun. an ill-assorted collection of parts assembled to fulfill a particular purpose. • computer: a machine, system, or program that has been badly put together. • verb. [tr.] use ill-assorted parts to make (something): Hugh had to kludge something together. Oh, and 'Blattenberg' translates as 'leaf mountain,' so a Blattenberger is one who lives on a leafy mountain. Oh well, that's better that poor Arnold Horshack or Welcome Back Kotter fame who claims it is a "very old and respected name" meaning "the cattle are dying." on the most sensational development, hitherto undreamed of, in amateur radio history! There isn't "ham" operator in the United States, or in the entire world for that matter, who won't be interested in knowing what is behind this curtain. 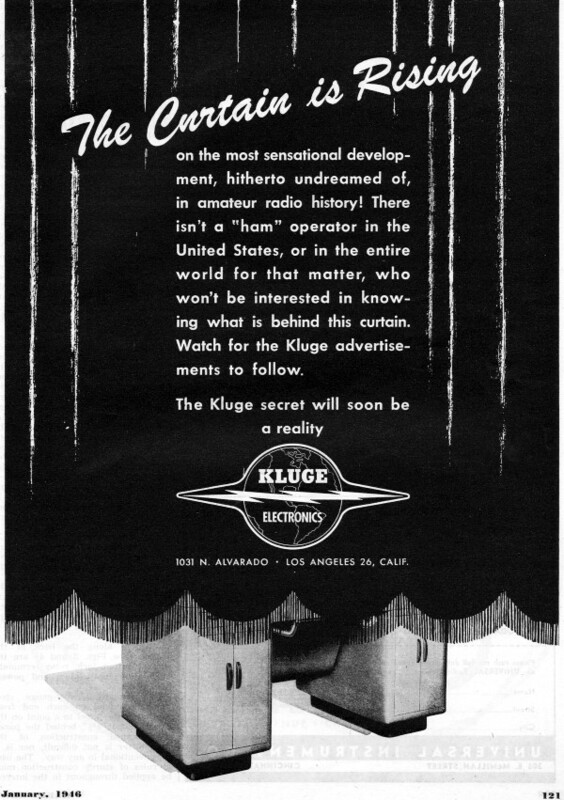 Watch for the Kluge advertisements to follow. The Kluge secret will soon be a reality. 1031 N. Alvarado Los Angeles 26, Calif.